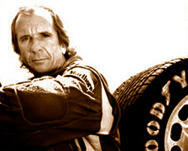 Formula One legend Emerson Fittipaldi wants to organise a karting race in St. Petersburg. The sportsman made this announcement on May 15 at a press conference in the Grand Hotel Europe. 'I am in St. Petersburg for the first time and I have really enjoyed myself,' said Mr Fittipaldi. 'It would be wonderful to organise a race around the city streets and it would be a great advertisement for the city and bring many tourists from Europe and America,' he added. City news archive for 19 May' 2003. City news archive for May' 2003.